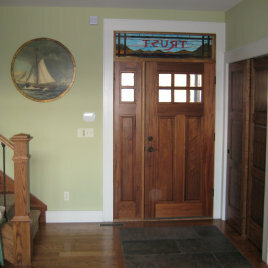 Jane contacted me about building a stained glass transom for her Dad's lake house. 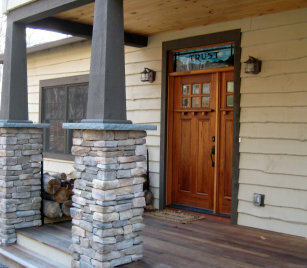 Mr. Trust is building a new Arts and Crafts style cottage as a retreat for his 5 children and 8 grandchildren overlooking Lake Wallenpaupack in Pennsylvania. Jane sent me a sample of lettering she liked and a great sketch of her original idea. Together we adapted her drawing to work with glass, and included a blue sky, mountains and a lake in the transom.....much like some of the Tiffany landscape windows of the late 1800s and early 1900's. I added the wood window panes to add to the Arts & Crafts styling of the window. The transom was designed for the front door of this house and as Jane described to me " will not only allow light and color into the foyer but will pick up the styling of the multiple hand made quilts that our mother made.....which will be a major focus of the interior artwork." 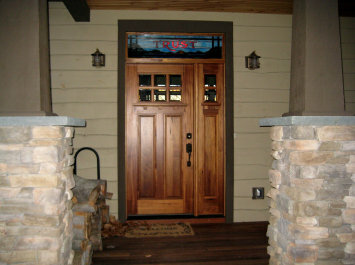 Jane graciously sent the pictures above after the transom was installed and the house finished . Note the magnificient wood door and the classic Arts and Crafts columns. I was proud to contribute my small part in the construction of this magnificient lake house.